Experience for the ﬁrst time Treasure Hunt in Sapporo Moerenuma Park operated in English and simple Japanese! The Park has some playground equipment, outdoor sports ﬁelds, and objects which are all designed by famous Japanese American artist, Isamu Noguchi. Have a fun the game and feel the “Creative City Sapporo”, which designated a City of Media Arts by UNESCO. *This is a rain-or-shine event. 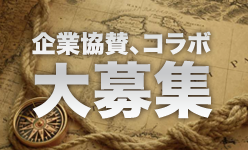 Please send Email to information@dmc-network.jp with a title of “Treasure Hunt in Sapporo Moerenuma Park” and NAME/ MOBILE NUMBER in the main text. *In case of cancellation on the event day, we will charge 100% of ticket fee.